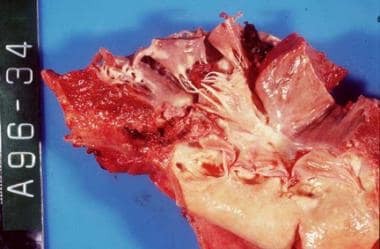 For further information on infective endocarditis, see Infective Endocarditis, Pediatric Bacterial Endocarditis, Infectious Endocarditis, and Neurological Sequelae of Infective Endocarditis. For patients with high cardiac risk, antibiotic prophylaxis is recommended for all dental procedures that involve manipulation of gingival tissue or the periapical region of teeth or perforation of the oral mucosa. Antibiotic prophylaxis is recommended for invasive respiratory tract procedures that involve incision or biopsy of the respiratory mucosa (eg, tonsillectomy, adenoidectomy). Antibiotic prophylaxis is not recommended for bronchoscopy unless the procedure involves incision of the respiratory tract mucosa. For invasive respiratory tract procedures to treat an established infection (eg, drainage of abscess, empyema), administer an antibiotic that is active against Streptococcus viridans. Patients with high cardiac risk who undergo a surgical procedure that involves infected skin, skin structure, or musculoskeletal tissue should receive an agent active against staphylococci and beta-hemolytic streptococci (eg, antistaphylococcal penicillin, cephalosporin). If the causative organism of respiratory, skin, skin structure, or musculoskeletal infection is known or suspected to be Staphylococcus aureus, administer an antistaphylococcal penicillin or cephalosporin, or vancomycin (if patient is unable to tolerate beta-lactam antibiotics). Vancomycin is recommended for known or suspected methicillin-resistant strains of S aureus. Antibiotics are no longer recommended for endocarditis prophylaxis for patients undergoing genitourinary or gastrointestinal tract procedures. Several studies have tracked the incidence of viridans group streptococci infective endocarditis (VGS-IE) following the guideline changes in the United States and the United Kingdom instituted in 2007 and 2008 respectively. The findings of one study supported the 2008 National Institute for Health and Clinical Excellence (NICE) in the United Kingdom guideline recommendations that antibiotic prophylaxis prior to invasive dental procedures was likely to not be of benefit in preventing infective endocarditis in patients with a history of rheumatic fever or a heart murmur. The authors did suggest though that patients at highest risk (eg, those with prosthetic valves) still might benefit. Note that the study was conducted in England; therefore, a limitation of the study is the external generalizability of the findings to other countries. The most common cause of endocarditis for dental, oral, respiratory tract, or esophageal procedures is S viridans (alpha-hemolytic streptococci). Antibiotic regimens for endocarditis prophylaxis are directed toward S viridans, and the recommended standard prophylactic regimen is a single dose of oral amoxicillin. Amoxicillin, ampicillin, and penicillin V are equally effective in vitro against alpha-hemolytic streptococci; however, amoxicillin is preferred because of superior gastrointestinal absorption that provides higher and more sustained serum levels. All doses shown below are administered once as a single dose 30-60 min before the procedure. Which organizations have endorsed the revised American Heart Association (AHA) Guidelines for Prevention of Infective Endocarditis? What key updates were made to the revised American Heart Association (AHA) Guidelines for Prevention of Infective Endocarditis? In which cardiac conditions is prophylactic regimens for endocarditis indicated? What are the AAOS and ADA recommendations for endocarditis prophylaxis in patients with orthopaedic implants who undergo dental procedures? When are antibiotic prophylactic regimens for endocarditis indicated for patients undergoing dental procedures? Which dental procedures do not require antibiotic prophylactic regimens for endocarditis? What are the recommendations for antibiotic prophylactic regimens for endocarditis in invasive respiratory tract procedures? What are the recommendations for antibiotic prophylactic regimens for endocarditis in skin or musculoskeletal tissue procedures? What are the recommendations for antibiotic prophylactic regimens for endocarditis in genitourinary or GI tract procedures? What is the incidence of viridans group streptococci infective endocarditis (VGS-IE) following guideline changes in the US and UK? Which antibiotics are used in prophylactic regimens for endocarditis? What is the standard general prophylaxis regimen for endocarditis? What is the prophylaxis regimen for endocarditis in patients unable to take oral medications? What is the prophylaxis regimen for endocarditis in patients allergic to penicillin? What is the prophylaxis regimen for endocarditis in patients allergic to penicillin and unable to take oral medication? Wilson W, Taubert KA, Gewitz M, Lockhart PB, Baddour LM, Levison M, et al. Prevention of infective endocarditis: guidelines from the American Heart Association: a guideline from the American Heart Association Rheumatic Fever, Endocarditis, and Kawasaki Disease Committee, Council on Cardiovascular Disease in the Young, and the Council on Clinical Cardiology, Council on Cardiovascular Surgery and Anesthesia, and the Quality of Care and Outcomes Research Interdisciplinary Working Group. Circulation. 2007 Oct 9. 116(15):1736-54. [Medline]. [Full Text]. Rethman MP, Watters W, Abt E, Anderson PA, Carroll KC, Evans RP, et al. The American Academy of Orthopaedic Surgeons and the American Dental Association clinical practice guideline on: The prevention of orthopaedic implant infection in patients undergoing dental procedures. J Bone Joint Surg Am. April 2013. 95(8):745-47. American Academy of Orthopaedic Surgeons. Information Statement 1033: Antibiotic Prophylaxis for Bacteremia in Patients with Joint Replacements. Available at http://orthodoc.aaos.org/davidgrimmmd/Antibiotic%20Prophylaxis%20for%20Patients%20after%20Total%20Joint%20Replacement.pdf. Accessed: May 14, 2013. Little JW, Jacobson JJ, Lockhart PB. The dental treatment of patients with joint replacements: a position paper from the American Academy of Oral Medicine. J Am Dent Assoc. 2010 Jun. 141(6):667-71. [Medline]. Desimone DC, Tleyjeh IM, Correa de Sa DD, Anavekar NS, Lahr BD, Sohail MR, et al. Incidence of infective endocarditis caused by viridans group streptococci before and after publication of the 2007 American Heart Association's endocarditis prevention guidelines. Circulation. 2012 Jul 3. 126 (1):60-4. [Medline]. [Full Text]. DeSimone DC, Tleyjeh IM, Correa de Sa DD, Anavekar NS, Lahr BD, Sohail MR, et al. Incidence of Infective Endocarditis Due to Viridans Group Streptococci Before and After the 2007 American Heart Association's Prevention Guidelines: An Extended Evaluation of the Olmsted County, Minnesota, Population and Nationwide Inpatient Sample. Mayo Clin Proc. 2015 Jul. 90 (7):874-81. [Medline]. Toyoda N, Chikwe J, Itagaki S, Gelijns AC, Adams DH, Egorova NN. Trends in Infective Endocarditis in California and New York State, 1998-2013. JAMA. 2017 Apr 25. 317 (16):1652-1660. [Medline]. [Full Text]. Katan O, Michelena HI, Avierinos JF, Mahoney DW, DeSimone DC, Baddour LM, et al. Incidence and Predictors of Infective Endocarditis in Mitral Valve Prolapse: A Population-Based Study. Mayo Clin Proc. 2016 Mar. 91 (3):336-42. [Medline]. [Full Text]. Thornhill MH, Dayer MJ, Forde JM, Corey GR, Chu VH, Couper DJ, et al. Impact of the NICE guideline recommending cessation of antibiotic prophylaxis for prevention of infective endocarditis: before and after study. BMJ. 2011 May 3. 342:d2392. [Medline]. [Full Text]. Dayer MJ, Jones S, Prendergast B, Baddour LM, Lockhart PB, Thornhill MH. Incidence of infective endocarditis in England, 2000-13: a secular trend, interrupted time-series analysis. Lancet. 2014 Nov 18. [Medline]. Thornhill MH, Lockhart PB, Prendergast B, Chambers JB, Shanson D. NICE and antibiotic prophylaxis to prevent endocarditis. Br Dent J. 2015 Jun 12. 218 (11):619-21. [Medline]. National Institute for Health and Clinical Excellence. Prophylaxis against infective endocarditis. Clinical guideline 64.1. Methods, evidence and recommendations. Available at http://www.nice.org.uk/guidance/cg64/evidence/full-guideline-addendum-196759982. September 2015; Accessed: March 18, 2016. Chambers JB, Thornhill M, Shanson D, Prendergast B. Antibiotic prophylaxis of endocarditis: a NICE mess. Lancet Infect Dis. 2016 Mar. 16 (3):275-6. [Medline]. Habib G, Lancellotti P, Antunes MJ, et al. 2015 ESC Guidelines for the management of infective endocarditis: The Task Force for the Management of Infective Endocarditis of the European Society of Cardiology (ESC). Endorsed by: European Association for Cardio-Thoracic Surgery (EACTS), the European Association of Nuclear Medicine (EANM). Eur Heart J. 2015 Nov 21. 36 (44):3075-128. [Medline]. Thornhill MH, Jones S, Prendergast B, Baddour LM, Chambers JB, Lockhart PB, et al. Quantifying infective endocarditis risk in patients with predisposing cardiac conditions. Eur Heart J. 2017 Nov 17. [Medline]. Nishimura RA, Otto CM, Bonow RO, Carabello BA, Erwin JP 3rd, Guyton RA, et al. 2014 AHA/ACC Guideline for the Management of Patients With Valvular Heart Disease: executive summary: a report of the American College of Cardiology/American Heart Association Task Force on Practice Guidelines. Circulation. 2014 Jun 10. 129(23):2440-92. [Medline].